Come create a one-of-a-kind “mini” painterly collage art quilt. Using one of the “Teeny Tiny Collage Patterns: by Laura Heine, we will cover the techniques to paint strips of patterns in these popular art quilts. The mini quilts are approximately 16” x “20” and can be finished or almost finished in one day. 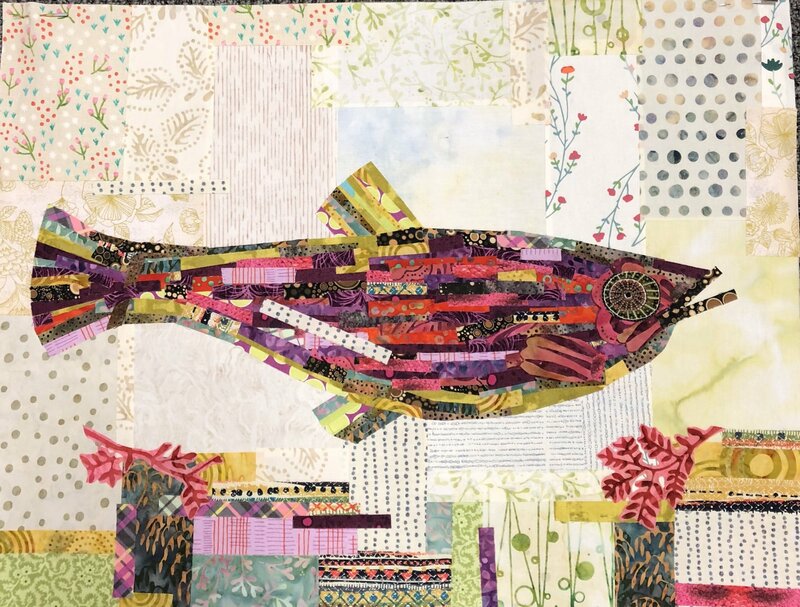 This class focuses on the strip approach, so I recommend students choose one of the strip or painterly patterns (the fish or the cow in the mini package) or the angel, the bull, the squirrel, or the cow in Laura Heine’s larger quilt patterns. Note, this class is designed for the smaller size. Note that the mini collage patterns include 3 patterns! So, you can make more collage patterns later. Some of the techniques we cover also apply to Laura’s other collage quilts, including the others included in the “mini package” but we will focus on the painterly strip patterns in this class. You can also use the painterly techniques to make your own pattern later. Laura Heine Teeny Tiny Collage Pattern or another Heine Strip Collage Pattern. 2-3 small pieces of tone on tone or low contrast prints to use in collage blending. Steam a Seam 2 fusible (NOT the Lite version). Strongly recommend Steam a Seam 2. These pieces are small and the Lite SAS2 may not hold the 12” wide works fine but wider also works. *****IMPORTANT**** Transparent Applique Pressing Sheet (17 x 24 or larger) works best. It must be transparent or semi-transparent for these mini collage quilts. Black for dark Sharpie pen (medium point, must be a ‘no-bleed’ permanent pen). Karen K Buckley medium scissors (ridged blades make cutting easier). Binding and Backing fabrics (not needed for class). Instructor: Kelly Zellars. Contact Kelly at Kelly.Zellars1@gmail.com (please put Collage question in subject line) or call Kelly at 704-704-763-8041.